(Monte Carlo, Monaco)- The new year offered proof the one-design J/70 fleet is thriving in Monaco and Europe, judging by the number that turned out to compete in Act III of the Monaco Sportsboat Winter Series, with 40 boats out on the water. “The race area and conditions were awesome, with a steady wind and flat sea. 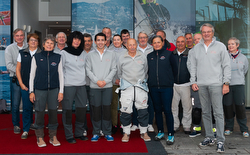 I was especially impressed by how responsive the Race Committee, the PRO Thierry Leret, and staff were in managing races in such quick succession,” said Ian Wilson, International J/70 Class President. He was racing this weekend on one of the Irish boats (Soak Racing) to see the Yacht Club de Monaco’s organization ahead of the J/70 Worlds that are set to take place in Monaco in 2021. For certain, the competitive level at the Monaco Sportsboat Winter Series continues to rise. 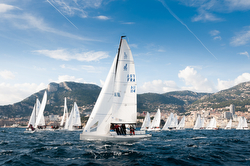 Many new teams were participating in anticipation of the 2021 J/70 Worlds in Monaco. 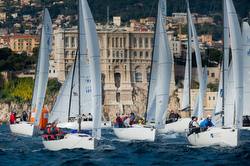 Teams came from Finland (for the first time), Sweden, and so did a veritable armada of Swiss, Germans and Russians, ever-loyal to Monaco’s monthly regattas. It was tough racing over the weekend and after seven races, the leader was the Russian Andreï Malygin skippering MARIA, winning both the Open and Corinthian Divisions! Knowing the record of some of the professionals out on the water, one can only be impressed by Malygin’s Russian team that were always in the lead group, posting an amazingly consistent 1-2-UFD-4-6-2-1 for 16 pts net. Flanking them on the podium were two Yacht Club de Monaco boats, Loïc Pompée’s ALLO III who was celebrating his birthday by taking the silver with a very consistent 7-5-6-17-5-3-6 for 32 pts net. Starting out mid-fleet but winning their next two races enabled Ludovico Fassitelli on JUNDA- BANCA DEL SEMPIONE to not only take the bronze, but continue as the leader of the overall winter championship; JUNDA’s record was 16-23-1-1-7-7-4 for 36 pts net. Rounding out the top five was the top Swiss team, Florian Geissbuehler’s ATTAQUE with a 3-11-2-18-1-14-8 for 39 pts net and the top Irish team, Marshall King’s SOAK RACING with a 15-16-4-5-10-1-10 tally for 45 pts net, both fourth and fifth, respectively. Tied on 45 pts with SOAK RACING was the top woman helm, Laurane Mettraux’s Swiss team on CER APROTEC VILLE DE GENEVE. Remarkably, there was one other team tied on 45 pts, yet another Swiss crew- Jean-Luc Leveque’s SWISS WATCH! All teams will meet again for the 35th Primo Cup presented by Credit Suisse, and garments from technical clothing supplier SLAM, 7-10 February 2019. A fine spectacle is in store in the bay of Monaco for this major one-design regatta that has been opening the Mediterranean season for the last 35 years. For more J/70 Monaco Winter Sportsboat series sailing information Add to Flipboard Magazine.